Reminder: Fireworks are Illegal in Corona. The City of Corona would like to remind everyone that it is illegal to possess, discharge, or sell fireworks. Residents should adhere to the “no fireworks” law throughout the City of Corona (Corona Municipal Code 9.33.010-9.33.030). Every year, people are seriously injured, property is damaged, and the risk of fires increases due to the illegal use of fireworks. Our extremely dry conditions create a greater potential for fires caused by fireworks, especially in or near the wild land urban interface of the Cleveland National Forest and Santa Ana Riverbed areas. Public Safety spends an extraordinary amount of time and resources responding to firework related incidents that can negatively affect the response times for other serious emergencies. Citations for violations of the City Ordinance banning fireworks will be issued to those possessing “Safe and Sane” fireworks; the fine is $500. The fine for possession of other types of fireworks (those not certified “Safe & Sane”) is $1000. Residents are encouraged to attend the Independence Day Family Festival and Firework show at Santana Park on July 1st from 4 p.m. to 10 p.m. Activities include games, bouncers, food booths and live entertainment. Entrance is free. For general questions about fireworks, please call the Corona Fire Department at 951-736-2220. 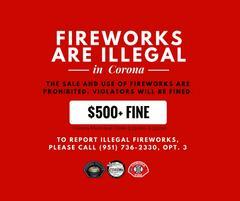 To report fireworks violations, call the Corona Police Department at 951-736-2330-Option 3. The City of Corona wishes to thank everyone for recognizing the seriousness of the “no fireworks” law and reminds everyone to be safe.